Have you ever conducted an investigation without asking any questions? There isn’t much to gain without them. A good investigator knows the importance of this skill and also knows how to ask the right questions in any given situation. Questions are key components when it comes to searching. In Psalm 139:23-24, David teaches the importance of invitation and examination through his questions. David asked God to search him and know his heart. He invited God to do the searching and questioning. David doesn’t mind being under investigation by God and continues with further examination as he asked God to try him and know his thoughts. David asks God to fully examine him while acknowledging in several verses before that God already knows who he is. Now, asking God to take a deeper dive into his head and his heart may seem a little strange at first, but not so much when you look more closely at the questions he asked God. David is getting to the root of it all by asking God to look for what displeases Him and see what causes grief. That’s powerful. David’s request for a full investigation is serious enough that he wants God to take action to lead him to a better way. David shows us how to ask the right questions of God. We should ask God to search our hearts and minds also on a regular basis for spiritual growth. Are you asking God to search deep within you and remove anything that is not honoring Him? When was the last time you asked God to test you for knowledge? 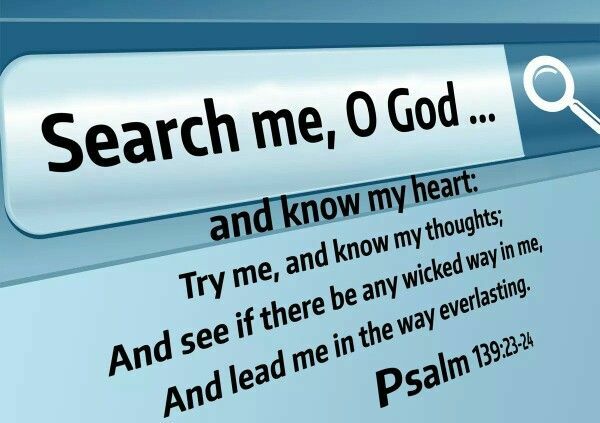 We used to sing this song growing up in my church: Search Me Lord, please search me Lord. If you find anything that shouldn’t be take it out and strengthen me. I want to be right, I want to be saved, I want to be whole. Now that’s what I call Living on Pitch. You gotta teach me that song!!!!! Thank you for your reply Jonathan. Yes, absolutely! Keep living on pitch.